BANGI, 21 October 2014 – Malaysia should strive to be at the forefront of space technology so that it can chart its own destiny on its own terms. Former Prime Minister, Tun Dr Mahathir Mohamad, said Malaysia needed to go further than just space travel for if we do not step up in the area, we will forever be a passenger in anything we do. That means somebody else will be in the driving seat and decide the destination and the extent of our participation, he said at The National University of Malaysia (UKM) Space Day today. It was held to give exposure to youth on opportunities in space science. Various activities were held spearheaded by four world astronauts to raise awareness about the study of space. The astronauts were, Malaysian icon Datuk Dr Sheikh Muszaphar Shukor Al Masrie; Dr Chiaki Mukai the first female Japanese astronaut; Klaus Dietrich, a German astronaut and Shalizan Sharipov, a Russian cosmonaut. Among the activities carried out was a dialogue session between students and the group of astronauts, a rocket building workshop, flight simulations and exhibition. 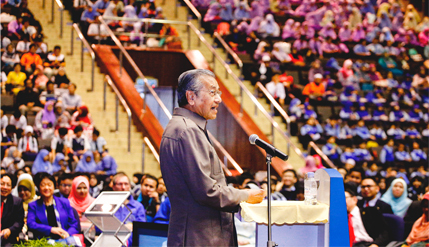 Tun Mahathir argues that Malaysia needed to go further than just space travel. Addressing the audience which comprises of students nationwide, he said the starting point of determining our own destiny is to have the right knowledge. And most of the knowledge today comes from the western world. He believes that being proficient in other languages is also paramount. Most of the research findings are in English and if we wait for it to be translated into bahasa Malaysia, it will be too late to take advantage of it. At a press conference later he was asked about space travel and accusations by critics that it was a waste of resources. He responded pointing to Sheikh Muzaphar, whom he said actually got to go for free. Malaysia did not pay anything as it was an offset for the purchase of Sukhoi fighter jets from Russia. He said many Malaysians do not realise that Sheikh Muzaphar went up there to do invaluable research on cancer cells and microbes but people do not understand that. Vice Chancellor Prof Datuk Dr Noor Azlan Ghazali, senior members of Universities and students attended the Space Day programme.